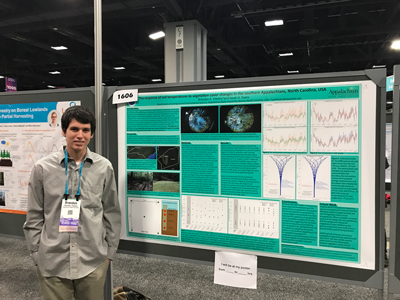 In December, fifteen faculty and students from four departmental areas in the College of Arts and Sciences with assistance from the Office of Student Research attended the fall American Geophysical Union Meeting in Washington, D.C. 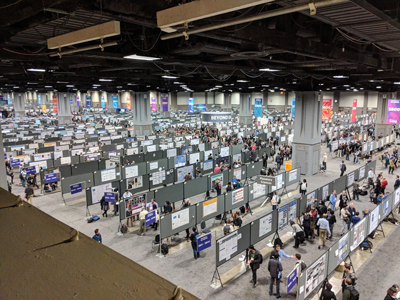 The American Geophysical Union (AGU) meeting is an opportunity to expose students to the broader subject of earth science and network with potential future employers and/or graduate advisors. Over 25,000 people attend this meeting, and presentations span an enormous range of earth science topics. AGU also provides faculty with the opportunity to present research and network with colleagues from other institutions, as well as stay informed about the latest developments in their fields. Undergraduate students, recent graduates and faculty members from the Departments of Geological and Environmental Sciences, Geography and Planning, Physics and Astronomy and Chemistry and Fermentation Sciences presented and participated in the meeting. Dr. Anton Seimon, research assistant professor, Department of Geography and Planning. Emily Fedders, a Chancellor's Scholar and Honors student, presented on the topic of “Streambank salt plume intrusion, concentration and residence times along a dynamic, urban headwater stream” which involves investigating effects of winter weather events and long-term stream salinity. Her research was completed with faculty members, William P. Anderson, Jr., Department of Geological and Environmental Sciences and Kristan M. Cockerill, Department of Cultural, Gender and Global Studies. This was Fedder's third conference and second AGU meeting. At previous conferences she has given talks and at this year’s event, she had meetings with potential research advisers for graduate school. Fedders was the first Appalachian Geological and Environmental Sciences student to be awarded Outstanding Student Presentation by AGU. Fedders, an undergraduate, competed for the award against largely graduate students from across the country and the world. “Undergraduate research has given me opportunities to think creatively and quantitatively, engage with science as a dynamic process beyond the covers of a textbook, apply what I learn in classes to real-world problems and gain experience working through large projects that will serve me well in graduate school and in life,” said Fedders. 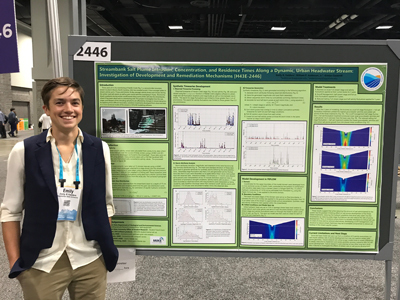 Emily Fedders and her poster on “Streambank salt plume intrusion, concentration and residence times along a dynamic, urban headwater stream.” Photo submitted. Hannah Field and Anton Hengst (Hengst, a Chancellor’s Scholar and Honors student) have used Landsat satellite imagery to investigate the evolution of proglacial lakes in northwest North America over the past 30 years. Proglacial lakes are lakes in front of glaciers that form when glaciers recede. Many of these lakes are forming or growing over the past 30 years due to climate warming and glacier retreat. Hengst has been developing an automated programming approach to extract proglacial lake area from satellite imagery and document its change over time. Field has been investigating physical controls (such as climate) on proglacial lake change behavior. Both Field and Hengst received funding from the Office of Student Research (OSR), as well as a majority of support coming from the National Science Foundation (NSF) for their research with Dr. William Armstrong. 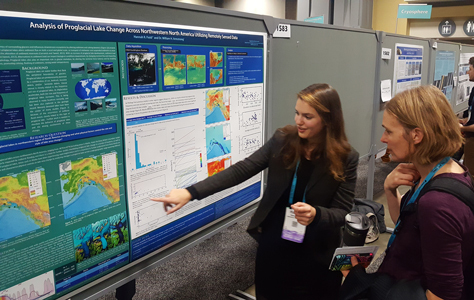 Hannah Field explains how proglacial lakes are changing to a University of Colorado researcher at AGU. Photo by William Armstrong. 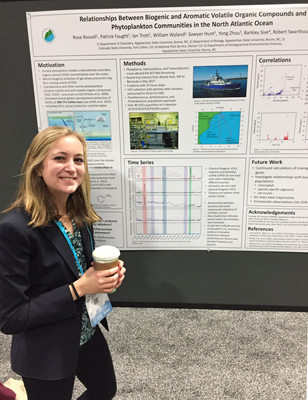 “Attending the American Geophysical Union meeting allowed me to receive valuable feedback on my current research, as well as make important connections with researchers in my field of study and areas which I am interested in pursuing for graduate school,” said Field. Anton Hengst describes his processing strategy to a University of Texas graduate student at AGU. Photo by William Armstrong. “AGU was fantastic. As an undergrad constantly considering a future in specific fields of my majors, it was eye-opening to be at such a major interdisciplinary conference and see the vast scope of what geophysical scientists are doing. I'm incredibly grateful to the Geological and Environmental Sciences department, OSR and my advisor Dr. Armstrong for enabling us to present among tens of thousands of international scientists,” said Hengst. 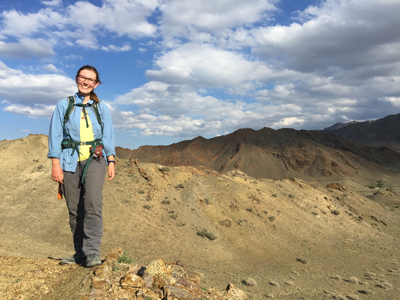 Olivia Paschall received travel assistance from the Office of Student Research, as well as external funds for her research costs associated with the work she presented from the Geological Society of America (Southeastern section) and the American Association of Petroleum Geologists. Paschall’s senior thesis work has been a culmination of the past two years working on the role of volcanism in mass extinctions. “Olivia applied for and received external funds to complete her part of the work (geochemical analyses). She did all of the statistical analysis and micron-scale mineralogical analysis, and - most importantly - she followed up her detailed analytical work to write the bulk of the paper. Her research topic is challenging and somewhat controversial, as she is one of the first people to correlate volcanism with this particular extinction event,” said Dr. Sarah Carmichael, Associate Professor, Department of Geological and Environmental Sciences. Olivia Paschall in the field mapping Devonian and Carboniferous sediments at the War Monument Locality. Photo taken by Sarah Carmichael. Paschall’s work is about the third pulse of extinction during the Late Devonian period, which occurred about 360 million years ago. At this point in time, no one has conclusively determined what caused the extinction and the associated ocean anoxia event, but she found that large-scale volcanic activity may have contributed to or triggered this event. Her research was recently published in a peer-reviewed journal, Global and Planetary Change, in which she is the lead author on a paper that includes collaborators from Germany, Japan, Vietnam and the U.S.
“I have definitely grown as a research scientist from this experience while conducting, writing and presenting my research over the past few years,” said Paschall. Brandon Yokeley received a Undergraduate Research Assistantship last fall and an Office of Student Research travel grant to fund the research he presented titled “The response of soil temperatures to vegetation cover changes in the southern Appalachians, North Carolina.” Yokeley’s presentation at AGU was the culmination of his independent undergraduate research. He is the first author on his presentation and was the sole author presenting the research to a geoscience audience of professionals and academics. In addition to providing Yokeley with an avenue to receive feedback on his research, he was also able to use this meeting to network with potential graduate program advisors and future collaborators. 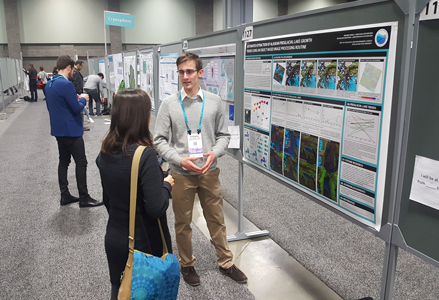 Undergraduate student Brandon Yokeley presenting his poster on vegetation influences on soil temperature at the annual American Geophysical Union meeting Fall 2019. Photo by Sarah Evans. “The ability to participate in undergraduate research and present that research at a national event has allowed me to become a more competitive student while applying for graduate school, along with gaining valuable experiences that I will use for the rest of my life,” said Yokeley. Dr. Cynthia Liutkus-Pierce was a co-author on a poster presented by former student Kevin Takashita-Bynum ’18. Takashita-Bynum is now a graduate student at the Watershed Institute at Murray State University in Kentucky. He was just awarded a $10,000 early career grant from the National Geographic Society for his graduate work in Ethiopia. Their poster presented a paleoenvironmental reconstruction of an early Miocene (~17 million year old) primate fossil site in western Turkana, Kenya. “In short, apes and monkeys diverged from a common ancestor somewhere in the latest Oligocene period (around 20 million years ago) and our work is significant, because the early Miocene is a time when we should be able to find evidence in the fossil record of the earliest primate groups that would eventually lead to apes (Hominoidea) and, eventually, to us (humans). So, essentially we are searching for our earliest ancestor. We also don’t know much about the environments that these ancestors lived in, so our work is one of only a few that attempts to reconstruct the climate and environmental conditions that may have shaped the Miocene evolution of the Hominoidea,” said Liutkus-Pierce. 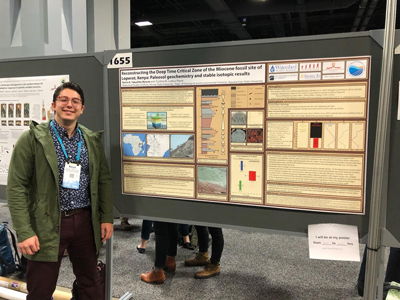 Kevin Takashita-Bynum ’18, Geology presenting his research poster at AGU from his field work in Kenya. Photo by Cynthia Liutkus-Pierce. Rose Rossell and Patrick Faught, both Honors students at Appalachian, received OSR support for supplies and assistance with travel to the AGU conference. They presented on “Relationships Between Biogenic and Aromatic Volatile Organic Compounds and Phytoplankton Communities in the North Atlantic Ocean. This research was completed with faculty member Dr. Robert Swarthout; fellow student Ian Trott, senior, Chemistry major; Barkley C. Sive, of the National Park Service in Denver, C.O. and Yong Zhou of Colorado State University in Fort Collins, C.O. Appalachian senior undergraduate environmental chemistry major, Rose Rossell, presents her research at the American Geophysical Union Fall Meeting. Photo by Bob Swarthout. “This meeting is widely regarded as the most influential geoscience meeting in the world, with thousands of participants from countries all over the world. I was especially proud of how all of our students used this as an opportunity to talk about their work, learn more about a wide variety of hot topics in their fields, and to network with potential graduate school advisors and employers,” said Dr. Robert Swarthout, Assistant Professor in both Departments of Chemistry and Fermentation Sciences, and Geological and Environmental Sciences. The Office of Student Research (OSR) was established in 2005 to expand the opportunities for undergraduate and graduate students to engage in research and mentored scholarship at Appalachian State University. Students who understand how discoveries are made in their chosen fields are well-prepared to address the unsolved problems of the future. OSR has a variety of resources, including financial support, to help research become a distinctive feature of the undergraduate and graduate experience at Appalachian. “It is very exciting to see so many undergraduates not only attend, but present at a large interdisciplinary conference. This speaks to not only our students but the faculty that mentor and encourage them to seek new knowledge,” said Dr. Becki Battista, Director of Office of Student Research. The poster hall at the American Geophysical Union Fall Meeting. Seven Appalachian undergraduate students and one alumni presented their research to the over 25,000 scientists in attendance. Photo by Bob Swarthout. Appalachian encourages student research, which gives the opportunity to work side by side with professors on meaningful research or creative endeavors and then present findings at regional, national and international conferences. Students who understand how discoveries are made in their chosen fields are well prepared to address the unsolved problems of the future. 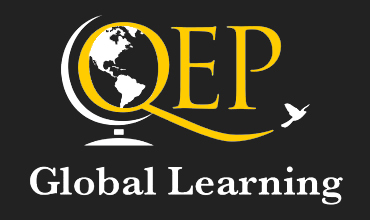 Learn more at http://osr.appstate.edu.